One of the biggest misconceptions about using social affinity targeting is that it’s only effective on social. There is indeed value in having tools that provide efficiency and insight in the social sphere, but mutual social affinities are so much more. Social affinities represent the consumer’s receptivity to brands, TV shows, celebrities and more; based on their entire experience, and not just the interactions on social media. ESPN was looking for another way to demonstrate the value of advertising on its properties. 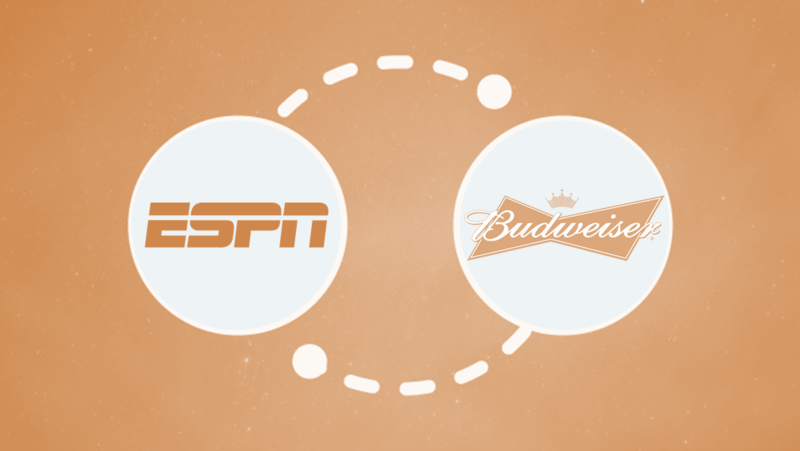 Using social affinity as a measure of effectiveness, ESPN demonstrated just how much client Budweiser gained traction vs. its competitors over an eight-month period advertising in multiple ESPN programs. AffinityAnswers reviewed TrueAffinity™ scores over that period between ESPN and Budweiser, as well as the network and Bud competitors. The trend graph below demonstrates not only that the ESPN advertising was effective, but that it actually decreased the share of affinity of its competitors. 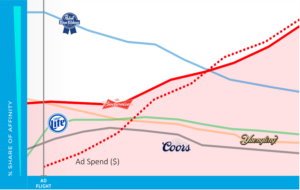 That is, the total social engagement between ESPN and others in the beer category – including Bud’s biggest competitors: Miller Light, Coors, Pabst and Yuengling – decreased. Startup: When the sponsorship began, the branding effectiveness among ESPN fans grew slowly. Like other branding campaigns, it takes time to arrive at the optimal reach and frequency. Rapid growth: Two months into the sponsorship, social affinity among ESPN fans towards Budweiser accelerated, with growth in affinity outpacing the increase in dollars spent. This is also the point where Bud competitors’ affinity started to decline. Maturation: Four months in, Bud-ESPN affinity growth began to trail the level of investment. While this does not mean social affinity had been capped, it does reflect a saturation point: the TV dollars had worked the hardest they possibly could to convert ESPN audiences into Budweiser audiences. Savvy marketers know that consumers don’t compartmentalize their experiences with brands. What they see on TV influences what they buy, and as shown here, how they interact digitally with brands. Social affinities are a quantifiable representation of those impacted by a TV ad, and a broader representation of the potential Bud audience – beyond those who already are purchasers.